In addition to the permanent galleries, the Reagan Library presents entertaining and informative temporary exhibitions on a wide range of subjects. The Library installs two to three new exhibitions a year, so check back to see what is new. DISCOVER THE MAN BEHIND THE LEGEND! What do pants, the pony express, cannons, paper money, skis, violins, bakhlava and “hooray!” have in common? Answer: Genghis Khan introduced them all to the West. Now the most comprehensive exhibition of Genghis Khan and his treasures invades the Reagan Library, its only Southern California stop on an international tour that has drawn more than a million visitors. As the exhibit strikingly portrays, Genghis’s reputation as the greatest conqueror is well-deserved – he dominated three times more land in his lifetime than either Julius Caesar or Alexander the Great, a conquest attested to by the formidable array of swords, bows, arrows, saddles and armor included on display in Genghis Khan. In fact, the historic exhibition showcases hundreds of artifacts from Genghis’s 13th century Empire, the largest such collection ever to tour. Curated and developed by dinosaur expert Don Lessem, the exhibition features more than 200 spectacular objects on display, including rare and sophisticated weapons, costumes, jewels, ornaments, instruments and numerous other fascinating relics and elaborate artifacts from 13th-century Mongolia. Titanic at the Reagan Library is a fascinating look at Titanic, combining real artifacts with the real stories of the people onboard the ill-fated ship. This new exhibit tells the story of the unsinkable ship in a way no museum has done before. Artifacts from passengers, dispersed over time, will be reunited in this exhibit for the first time in over 100 years. 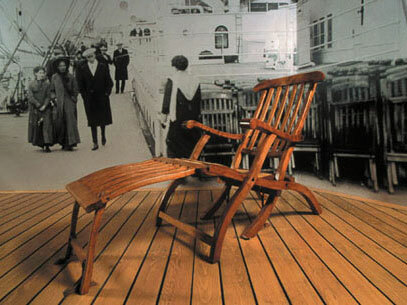 A deck chair from the Titanic, one of only eight known to exist, as well as the only known “widows seat” deck chair from Carpathia. Sheet music for “Narcissus” which was found on the body of Wallace Hartley, the musician who continued to play his violin, even as the ship was sinking. The only known complete set of boarding documents and tickets from the Titanic. A pocket watch from an unknown 3rd class victim who was buried at sea. The Claim Form of the “Unsinkable” Molly (Margaret) Brown and other passengers and relatives, for loss of life and property. The exhibit featured over 700 artifacts, including some of the rarest, historic and iconic baseball memorabilia from the largest known private collector in the United States. Extraordinary artifacts were on display from Babe Ruth, Joe DiMaggio, Lou Gehrig, Jackie Robinson, the Los Angeles Dodgers, and scores of other historically important players and organizations. Nancy Reagan : A First Lady's Style focused on the roles Mrs. Reagan played in the White House: hostess and ambassador, public servant and spokesperson, and loyal, caring wife. The exhibition showcased almost 80 of her dresses, suits, and gowns spanning a fifty year timeframe. The outfits range from her March 4, 1952 wedding dress to the skirt suit she wore to President Reagan's funeral in June of 2004. The exhibition included designs by Geoffrey Beene, Bill Blass, Valentino, James Galanos, Carolina Herrera, Adolfo, Yves St. Laurent, Oscar de la Renta, Jean Louis and Chanel. Read My Pins presents a remarkable range of more than 200 pins and brooches from the personal collection of Madeleine Albright. The majority of these pieces were collected and worn during Albright’s service as US Ambassador to the United Nations (1993–1997) and as the first female Secretary of State (1997–2001), under President Bill Clinton. The assortment is eclectic, international, and representative of nearly a century of jewelry design. Yet the jewelry’s true interest lies not in their materials or monetary value but in the roles they played during her government service: Albright used her pins as silent yet visually outspoken codes to foreign officials and the press. Pins could be adopted for various reasons—a shining sun or a patriotic flag would reinforce a positive alliance with the United States, for example, whilemore difficult negotiations might bring out wasps or snakes. These objects became delicate instruments with which she applied pressure during intense negotiations, and into which she invested humor as she represented the United States on the international stage. The Ronald Reagan Presidential Library opened a special exhibit featuring the White House Miniature, an authentic recreation of the White House measuring 50 feet long and 18 feet wide: a one-foot-to-one-inch scale. Taking over 600,000 hours of labor to create, the miniature is an amazing replica, showing visitors an intimate look into the White House - from the Lincoln bedroom to the Oval Office to tiny, working televisions to hand-carved chairs, tables and crystal chandeliers. Created by the Zweifel family, and first exhibited in 1979, the Miniature White House has been seen by over 42 million Americans. Approximately 100 original objects associated with George Washington – including the only surviving complete set of his famous dentures – were on display for the Reagan Library’s special exhibition, Discover the Real George Washington: New Views from Mount Vernon. The exhibition went beyond the iconic image on the dollar bill to reveal the real George Washington as not only a general and president but as a young land surveyor, experimental farmer, and savvy entrepreneur. Washington’s views on religion and slavery, and the influence of his wife, Martha, were also explored in this exhibition which featured life-size figures of Washington developed through a cutting-edge forensic investigation, engaging videos, original artifacts, intricate three-dimensional architectural models, and interactive displays. Presented by D23: The Official Disney Fan Club and The Ronald Reagan Presidential Foundation and Library, D23 Presents Treasures of The Walt Disney Archives was the largest exhibition ever curated by the Walt Disney Archives, at 12,000 square feet. From Oswald the Lucky Rabbit and Mickey Mouse to Captain Jack Sparrow and Captain America, the exhibition featured more than 500 artifacts, at least half of which had never been seen by the public—including models, props, costumes, set pieces, and artwork from throughout Disney history. Magna Carta: The Essence of Democracy explored why the 1215 Magna Carta is widely viewed as one of the most important documents in the history of our freedom and how it became the cornerstone of the U.S. Constitution. The highlight of this exhibition was the original 1215 Magna Carta, on loan from Lincoln Cathedral in Lincolnshire, England.